Culms: Erect, solitary or clumped, usually un-branched above base, firm, glabrous. Blades: Flat, narrow, 4 to 24 inches long, to 3/5 inch wide, nearly glabrous, leaf base with triangular patch of hair on upper surface. Sheaths: Shorter than internodes, glabrous, often reddish or purplish at bases. Ligules: Dense fringes of hairs. 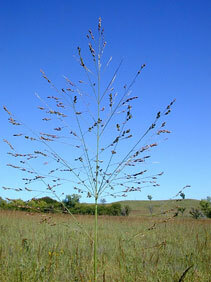 Inflorescences: Panicles, open, much-branched, ovate to pyramidal, 6 to 20 inches long, usually 1/3 to 1/2 as wide as long; branches long, ascending or spreading, bearing spikelets near ends. Spikelets: Short-stalked, 2-flowered, egg-shaped, to 1/4 inch long, swollen, prominently nerved, tapered to sharp points; glumes unequal; lemmas 1 fertile, 1 staminate or sterile; awns absent. Habitat: Moist, open lowland prairies, sand prairies, and open woods, on broad range of soils. Forage Value: Switchgrass is very nutritious and is readily consumed by livestock. Palatability declines rapidly as plant matures. Switchgrass makes good hay when cut young. Uses: Many birds and mammals eat the seeds and foliage and use the plant for cover. Comments: Strongly rhizomatous. The roots are quite vigorous, sometimes growing 10-11 feet long.